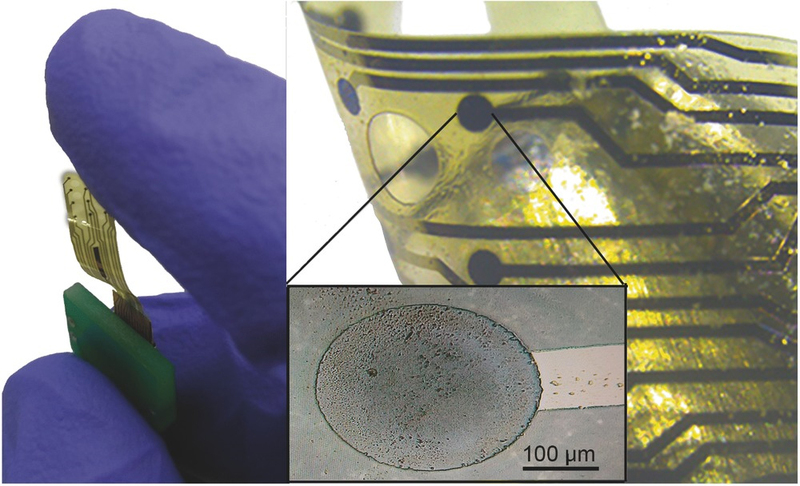 Thin‐film neural devices are an appealing alternative to traditional implants, although their chronic stability remains matter of investigation. In this study, a chronically stable class of thin‐film devices for electrocorticography is manufactured incorporating silicon carbide and diamond‐like carbon as adhesion promoters between glassy carbon (GC) electrodes and polyimide and between GC and platinum traces. The devices are aged in three solutions—phosphate‐buffered saline (PBS), 30 × 10−3 and 150 × 10−3m H2O2/PBS—and stressed using cyclic voltammetry (2500 cycles) and 20 million biphasic pulses. Electrochemical impedance spectroscopy (EIS) and image analysis are performed to detect eventual changes of the electrodes morphology. Results demonstrate that the devices are able to undergo chemically induced oxidative stress and electrical stimulation without failing but actually improving their electrical performance until a steady state is reached. Additionally, cell viability tests are carried out to verify the noncytotoxicity of the materials, before chronically implanting them into rat models. The behavior of the GC electrodes in vivo is monitored through EIS and sensorimotor evoked potential recordings which confirm that, with GC being activated, impedance lowers and quality of recorded signal improves. Histological analysis of the brain tissue is performed and shows no sign of severe immune reaction to the implant.